Objectives Knee joint distraction (KJD) is a novel, but poorly understood, treatment for osteoarthritis (OA) associated with remarkable ‘spontaneous’ cartilage repair in which resident synovial fluid (SF) multipotential mesenchymal stromal cells (MSCs) may play a role. We hypothesised that SF hyaluronic acid (HA) inhibited the initial interaction between MSCs and cartilage, a key first step to integration, and postulate that KJD environment favoured MSC/cartilage interactions. Methods Attachment of dual-labelled SF-MSCs were assessed in a novel in vitro human cartilage model using OA and rheumatoid arthritic (RA) SF. SF was digested with hyaluronidase (hyase) and its effect on adhesion was observed using confocal microscopy. MRI and microscopy were used to image autologous dual-labelled MSCs in an in vivo canine model of KJD. SF-HA was investigated using gel electrophoresis and densitometry. Results Osteoarthritic-synovial fluid (OA-SF) and purified high molecular weight (MW) HA inhibited SF-MSC adhesion to plastic, while hyase treatment of OA-SF but not RA-SF significantly increased MSC adhesion to cartilage (3.7-fold, p<0.05) These differences were linked to the SF mediated HA-coat which was larger in OA-SF than in RA-SF. OA-SF contained >9 MDa HA and this correlated with increases in adhesion (r=0.880). In the canine KJD model, MSC adhesion to cartilage was evident and also dependent on HA MW. 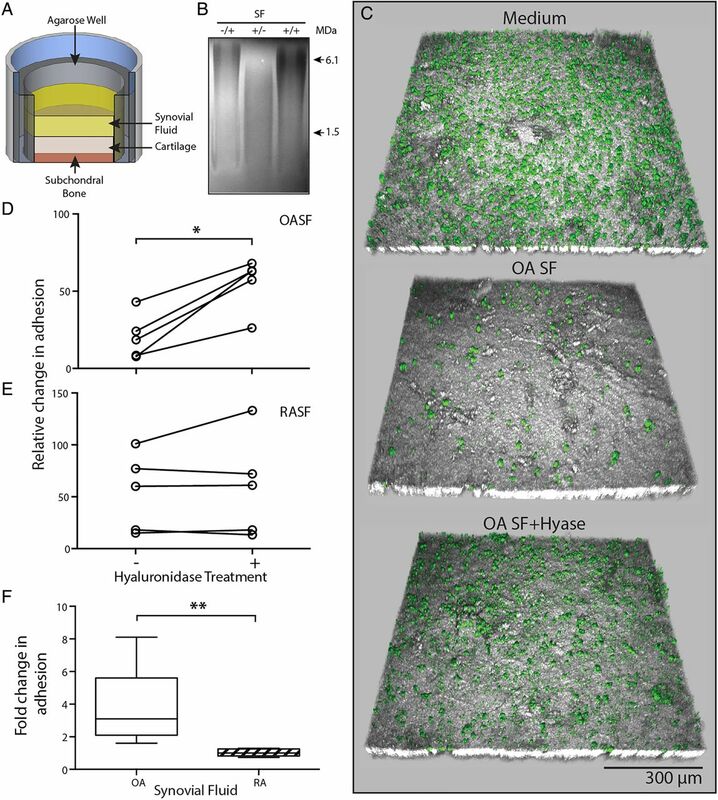 Conclusions These findings highlight an unappreciated role of SF-HA on MSC interactions and provide proof of concept that endogenous SF-MSCs are capable of adhering to cartilage in a favourable biochemical and biomechanical environment in OA distracted joints, offering novel one-stage strategies towards joint repair. There is an emerging interest in the use of multipotential mesenchymal stromal cells, also termed mesenchymal stem cells (MSCs) and/or scaffolds for joint repair.11–14 The biological basis for KJD-associated spontaneous joint repair without addition of scaffolds, growth factors or exogenous cells is not understood, but clearly indicates a resident endogenous repair capacity. Joint resident MSCs and the local biochemical and biomechanical environment are anticipated to be central to this phenomenon. Key endogenous factors leading to intrinsic cartilage repair are likely associated with SF-MSCs, joint biomechanics and SF homeostasis including growth factors and hyaluronic acid (HA) composition. Given that SF-MSCs highly express CD44,15 ,18 ,19 ,21 we hypothesised that interactions between CD44 and HA lead to the formation of a pericellular coat (HA-coat).22–25 These interactions in an OA environment might profoundly influence and potentially block MSC adhesion to cartilage. We further hypothesised that KJD might also affect these interactions. Herein, we show a critical molecular weight (MW) dependent role for SF-HA in determining SF-MSC interactions with cartilage in vitro and in vivo that opens up a hitherto unappreciated mechanism for understanding how resident SF-MSCs could be manipulated to develop better one-stage therapies for OA in KJD and other settings. SF-MSCs were dual-labelled with fluorescent micro-sized particles of iron oxide (FMPIO, Bang Laboratories). Macroscopically normal osteochondral (OC) plugs (8 mm diameter) were placed into a preformed 8 mm diameter well of sterile 2% agarose. FMPIO-SF-MSCs (p2-4, 5×104 per OC plug) were resuspended in either a culture medium, OA-SF or RA-SF with or without addition of hyaluronidase (hyase, see online supplementary information) before being added to the OC plug and incubating overnight at 37°C. Thereafter, the cartilage surface was gently washed and adherent SF-MSCs were fixed in 3.7% formalin. Confocal microscopy was used to image attached cells. Mixed breed dogs were obtained from Utrecht University animal laboratory. The Utrecht University Committee of Experiments on Animals approved the study according to Dutch law (DEC: 2011.III.11.116). Canine Groove model of OA was bilaterally induced in the right and left stifle joints in three dogs.26 ,27 After 10 weeks, KJD was performed on the right stifle joint for 5 days. The external fixation frame was placed onto the femur and the tibia under general anesthesia and pain medication. Autologous FMPIO-labelled MSCs (passage (p) 2) were recovered from frozen. Each knee received 5.6–8.7×106 autologous cells injected into the synovial cavity in 1 mL saline supplemented with 5% canine serum 72 h after placement of the external fixation frames. Each animal was allowed to continue normal daily activities before euthanising 48 h after MSC injection, whereby the joints were dissected and fixed in formalin. Statistics were performed using SPSS Statistics V.21 (IBM, Portsmouth). Unless otherwise stated, all data were treated as non-parametric. Where applicable, paired analysis was done using the Wilcoxon Signed Ranks and non-paired using the Mann-Whitney U test. Correlations were calculated using the Spearman's rank correlation coefficient for non-parametric data. For further details please see online supplementary information. Recovery and expansion of SF-MSCs directly from SF was poor; however, by replacing SF with culture medium, cells readily adhered and proliferated on tissue culture plastic (figure 1A). To investigate to what extent SF inhibited MSC adhesion, we obtained RA-SF (n=5) and OA-SF (n=5) and determined the relative adhesion of culture expanded (p2-4) SF-MSCs in the presence of RA-SF and OA-SF. Adhesion of SF-MSCs in RA-SF was greater than that in OA-SF, with a mean twofold increase (p=0.008) in adhesion (figure 1B). Antiadhesive nature of osteoarthritic (OA) synovial fluid (SF) on tissue culture plastic. (A) Direct plating of SF or replacement of SF by culture medium illustrating the extent to which synovial fluid-mesenchymal stromal cell (SF-MSC) adhesion is affected by osteoarthritic-synovial fluid (OA-SF). Gross (left) and magnified (right) images of culture morphology. (B) Differential adhesion of expanded SF-MSCs in OA-SF and rheumatoid arthritic-synovial fluid (RA-SF) (n=5 each, non-paired analysis). (C) Increase in adhesion of SF-MSCs in OA-SF after predigestion with hyase (n=5, paired analysis). (D) Differential effect of hyase treatment on SF-MSC adhesion in RA-SF and OA-SF (n=5 each, non-paired analysis). (E) Increasing concentrations of high, but not low molecular weight hyaluronan (HMWHA and LMWHA, respectively) inhibit the adhesion of SF-MSCs from three donors. *p<0.05, **p<0.001; individual samples are given in (C), median values with 25% (box) and 75% (whiskers) CI are presented in (B) and (D). HA is known to mediate cell adhesion;24 ,25 therefore, we investigated whether RA-SF, OA-SF and exogenous HA influenced adhesion of SF-MSCs. SF samples were pretreated with hyase. The OA-SF hyase treatment markedly increased SF-MSC adhesion, (mean 1.6-fold increase ±0.2 SD, p=0.04, figure 1C). In contrast, hyase treatment of RA-SF had no effect. Comparing hyase treatment of OA-SF and RA-SF highlighted a clear difference (p=0.008, figure 1D) between the adhesion of SF-MSCs in these two types of fluid. To further clarify the role of HA and to specifically exclude another unanticipated effect of hyase, we used purified, commercially obtained preparations of high and low MW HA (HMWHA and LMWHA, respectively) to supplement culture medium. We observed that, only HMWHA inhibited SF-MSC adhesion from three different donors (figure 1E). We used FMPIO labelled-MSCs in a novel in vitro adhesion model with OA derived cartilage, SF and SF-MSCs. Labelled SF-MSCs (see online supplementary figure S1) were added to the joint-facing surface of OC plugs in RA-SF or OA-SF with or without prior digestion of SF with hyase (figure 2A). So as not to digest HA content of the cartilage, heparin, a known inhibitor of hyase was added to all samples prior to the addition of SF-MSC to OC plugs.28 The inhibitory effect of heparin is demonstrated in figure 2B compared with non-digested-SF, by the maintenance of HMWHA species (similar to non-digested), which are lost without addition of heparin. Osteoarthritic (OA) environment limits mesenchymal stromal cell (MSC) attached to cartilage surface. (A) Experimental setup of our novel in vitro adhesion assay. (B) Agarose gel electrophoresis illustrating inhibition of hyase by heparin. Heparin only, −/+; hyase only, +/−; heparin and hyase, +/+. (C) Representative confocal images showing a topographical view of adherent fluorescent micro-sized particles of iron oxide (FMPIO) labelled synovial fluid-mesenchymal stromal cells (SF-MSCs) (green) to superficial cartilage surface (grey), in the presence of culture medium (top), osteoarthritic-synovial fluid (OA-SF) (middle) and after pre-hyase treatment of OA-SF (bottom). (D) Quantification of labelled-MSC adhesion to cartilage surface relative to adhesion in culture medium, showing the consistent increase in adhesion upon pre-hyase digestion of OA-SF (n=5, paired analysis). (E) Equivalent data as in (D) showing SF-MSC adhesion to cartilage in rheumatoid arthritic-synovial fluid (RA-SF) (±hyase pretreatment). (F) Relative differences in adhesion expressed as a fold change of labelled MSCs adhered to cartilage surface after hyase treatment of RA-SF and OA-SF (n=5 each, non-paired analysis). *p<0.05, **p<0.001; individual samples are given in (D) and (E), median values with 25% (box) and 75% (whiskers) CI are presented in (F) and (D). Each in vitro adhesion assay included a positive control whereby SF-MSCs were resuspended and added to OC plugs in culture medium used to normalise adhesion seen in SF and SF+hyase experiments (culture medium samples representing 100% adhesion). 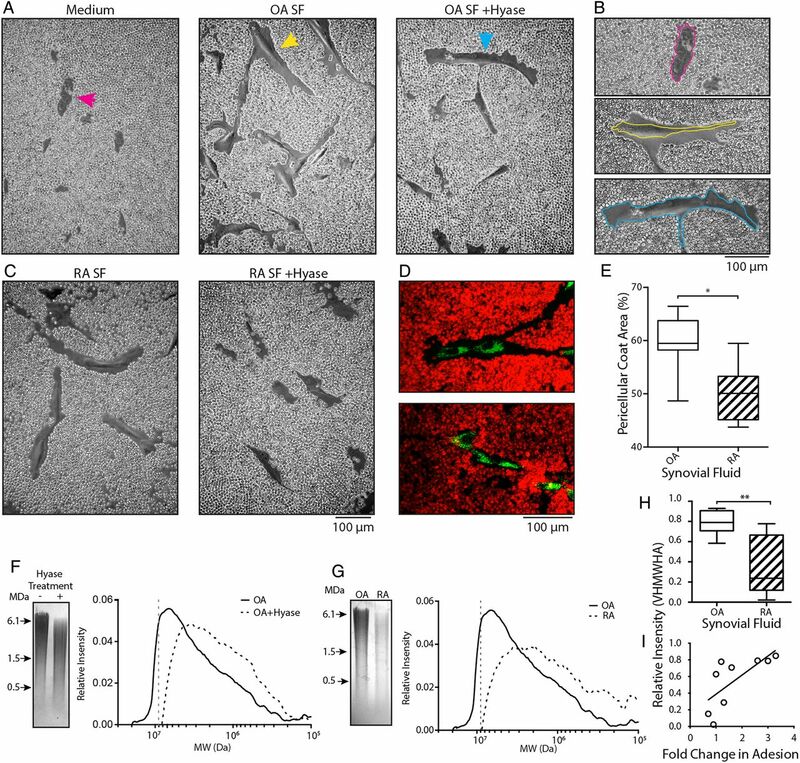 Representative confocal images from one adhesion assay using OA-SF are shown in figure 2C. An almost confluent layer of cells can be seen in the positive control image. Upon incubation of SF-MSCs in OA-SF the number of cells adhered is markedly reduced. Adhesion was recovered by pretreating OA-SF with hyase, to levels approaching that of the control. This clear increase in SF-MSC adhesion after SF hyase treatment was consistent across each OA-SF donor (p=0.042, figure 2D), with a mean fold-change increase of 3.7 (±2.3 SD). In contrast, and consistent with experiments on plastic, hyase treatment of RA-SF did not increase SF-MSCs adherence (figure 2E). 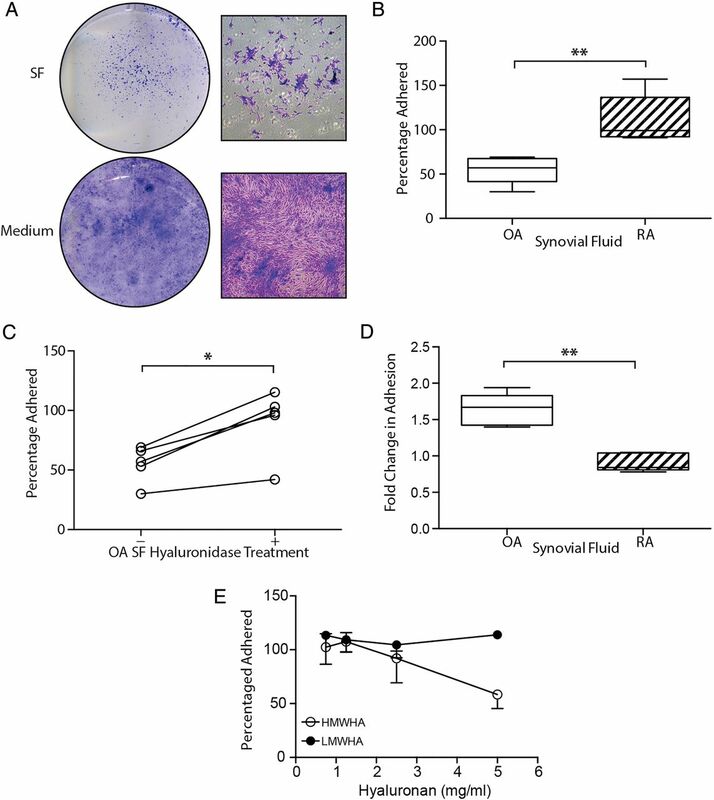 This clear difference in the effect of hyase between OA-SF and RA-SF (p=0.008, figure 2F) confirms that the antiadhesive nature of OA-SF extends to inhibiting SF-MSC adhesion to cartilage. Increases in adhesion seen in OA-SF were confirmed to be a result of hyase activity rather than toll-like receptor 4 (TLR4) signalling, known to induce adhesion of some cell types29–31 (see online supplementary figure S2). The HA-coat is an important mediator in the initial stages of cell adhesion.24 ,25 ,32 Given the dramatic effect of hyase treatment on OA-SF and SF-MSC adhesion, we determined if exposure of SF-MSCs to SF induced HA-coat formation. Preadhered SF-MSCs were overlaid with culture medium containing 0%, 10%, 20% or 30% OA-SF or RA-SF (±hyase pretreatment, supplemented with heparin). After overnight incubation, these were replaced with fixed red blood cells (RBCs) and allowed to settle under gravity. RBCs formed a clear exclusion zone around MSCs exposed to non-digested (native) OA-SF, which impeded the progression of the RBCs towards the cell (figure 3A, B). These exclusion zones indicate the presence of an HA-coat and are further confirmed following enzymatic digestion with hyase (Movie S1). Culture medium alone or culture medium supplemented with hyase treated OA-SF and RA-SF abolished HA-coat formation (figure 3A–D). SF-MSCs exposed to RA-SF also exhibited an HA-coat; however, these exclusions zones were significantly smaller than that formed in OA-SF. The HA-coat accounted for 59.3%±5.6 and 50.0%±5.5 of the RBC exclusion zones in OA-SF (n=7) and RA-SF (n=6), respectively (means±S.D, figure 3E, p=0.038). Synovial fluid promotes pericellular hyaluronan-coat formation and is responsible for differences in adhesion to cartilage. (A) Red blood cell (RBC) exclusion assay showing synovial fluid-mesenchymal stromal cells (SF-MSCs) without a hyaluronic acid (HA)-coat in culture medium (left, magenta arrow). SF-MSCs and the presence of an HA-coat after exposure to 10% OA-SF (middle, yellow arrow). Predigestion of OA-SF with hyase fails to induce formation of the HA-coat (right, blue arrow). (B) Highlighted cells from (A), with perimeter of the cell indicated by the coloured line. (C) RBC exclusion assay using rheumatoid arthritic (RA)-derived SF without hyase digestion (left); after prior digestion with hyase (right). (D) Confocal microscopy images of SF-MSCs exposed to osteoarthritic-synovial fluid (OA-SF) (top) and hyase treated OA-SF (bottom) confirming the presence and absence of the HA-coat under these conditions. SF-MSCs are stained green and RBCs stained red. (E) Quantification of the HA-coat area formed by native OA-SF and rheumatoid arthritic-synovial fluid (RA-SF) (n=7 and n=6, respectively; 109 measurements, 40 from OA and 69 from RA donors, non-paired analysis). (F) Representative gel electrophoresis and associated densitometry plot for OA-SF with and without hyase digestion. (G) Representative gel electrophoresis and corresponding densitometry plots showing example OA-SF compared with RA-SF. (H) Relative intensity of very high molecular weight HA (VHMWHA) (>9 MDa HA, represented by the grey dotted line in (F) and (G)) between native OA-SF and RA-SFs used in our in vitro adhesion assay (n=5 each by non-paired analysis). (I) Correlation between proportion of VHMWHA and fold change in adhesion, showing hyase treatment increases adhesion in those SF with more VHMWHA (r=0.88, p=0.002 n=9, non-parametric analysis). *p>0.05, **p<0.005. Having identified a clear difference between OA-SF and RA-SF on the adhesion and induction of HA-coat formation with SF-MSCs, we further analysed the HA component of SFs. Agarose gel electrophoresis and densitometry were used to investigate the HA content of OA-SF and RA-SF (figure 3F, G), comparing the MW and relative abundance of HA within each SF.33 A clear difference in HA content of native and hyase treated SF was seen, with native SF having more abundant, higher MW species (figure 3F). A similar difference was also seen between native non-hyase digested OA-SF and RA-SF (figure 3G), indicating that OA-SF has more abundant HMWHA. Analysis of SF used in our in vitro assay demonstrated a difference in the proportion of very high MW HA (VHMWHA, >9 MDa) between OA-SF and RA-SF (figure 3H, p=0.008). We next sought to determine if this difference in VHMWHA correlated with the difference seen between changes in MSC adhesion to cartilage upon hyase digestion. A direct correlation between the proportion of VHMWHA in native SF and the fold change in adhesion after digestion of SF with hyase was seen (figure 3I, r=0.88, p=0.002). We hypothesised that KJD alters the SF environment in favour of interactions between SF-MSCs and injured cartilage; key stages towards successful colonisation, differentiation and integration, which may contribute to the remarkable cartilage repair seen in humans and animals9 ,10 ,34 (see online supplementary figure S4). Intra-articular injection of autologous FMPIO-labelled adipose tissue derived (AT) MSCs in the bilateral Canine Groove model was performed and investigated in relation to canine SF-HA MW (figure 4). AT-MSCs used for injection formed colonies (figure 4B) and proliferated in vitro as expected. FMPIO uptake was good, (mean 86%±3.0%, n=3) as determined by flow cytometry (figure 4C, D) and expanded cells displayed tri-lineage differentiation potential (figure 4E). In vivo osteoarthritis model and mesenchymal stromal cell (MSC) adhesion to cartilage under knee joint distraction. (A) Experimental setup of in vivo adhesion model; phases in the experiment are indicated in days. (B) Adipose tissue derived (AT)-MSC colony grown from canine fat pad digest. (C) Fluorescent micro-sized particles of iron oxide (FMPIO)-labelling of AT-MSCs (phase contrast, top; fluorescence, bottom). (D) Flow cytometry analysis of FMPIO uptake by AT-MSCs from each dog (green, red and blue histograms; grey histogram is non-labelled cells from a single dog). (E) Tri-lineage differentiation of AT-MSCs showing adiopgenesis (top and bottom), osteogenesis (AZ, alizarin red; ALP, alkaline phosphatase staining) and chondrogenesis (gross morphology, top; toluidine blue stained section, bottom). (F) Sagittal-MRI of a femur from a distracted limb showing presence of FMPIO-labelled MSCs (green arrows), a bone marrow lesion (yellow arrow) and cartilage defect (blue arrow). (G) Sagittal-MRI of a control joint without the addition of FMPIO-labelled AT-MSCs. (H) Topographical confocal images of cartilage defects adjacent to the bone marrow lesion in (F) showing the presence of FMPIO-labelled MSCs. (I) Topographical confocal image of control cartilage seen in (G). (J) Example gel electrophoresis and associated densitometry plot of synovial fluid (SF) from a matched contralateral control and distracted joint (>7 MDa, grey dotted line). (K) Relative proportion of high molecular weight hyaluronan (HMWHA) (>7 MDa) in each control and distracted joint. Matched animals are indicated by the black line. (L) Correlation between HMWHA in these joints and the percentage of total MSCs adhered per mm2 of imaged joint surface. r=−0.6, p=0.2, n=6, non-parametric analysis. Osteoarthritic lesions developed on the medial and lateral compartment of the canine femur as well as the untouched tibia after approximately 10 weeks, consistent with previous experience26 ,27 in both the hind limbs of all three dogs. KJD was applied to one hind limb, 3 days prior to intra-articular injection of labelled MSCs. The dogs were sacrificed 48 h after MSC injection (figure 4A). MRI identified labelled MSCs on the cartilage surface of the femur, as areas of hypointense contrast (dark areas) against the hyperintense contrast (light areas) of the thin cartilage layer (figure 4F) in four of the six joints. No hypointense areas were seen on cartilage surfaces of joints without injection of labelled MSCs (figure 4G). Confocal microscopy was used to investigate the presence of labelled MSCs within each cartilage defect, which was not possible with MRI due to labelled MSCs and areas of denuded bone having similar hypointense contrast and signal intensity (figure 4H). Confocal microscopy revealed MSCs in all six medial compartment defects (distracted and control non-distracted joints), adjacent to bone marrow lesions seen under MRI (yellow arrow, figure 4F). Gel electrophoresis and densitometry were used to determine the HA content of SF from control and distracted joints (figure 4J). SF-HA was noticeably reduced in all three distracted joints, with HMWHA (>7 MDa) also reduced upon distraction (figure 4K). A trend between the total number of cells detected (using confocal microscopy) and the proportion of HMWHA in SF from control and distracted joints (figure 4L, r=−0.60, p=0.2) was also observed. Remarkable yet poorly understood repair following KJD has been reported.9 ,10 Herein we demonstrate the potential for SF-MSCs to adhere to cartilage, a prerequisite for SF-MSC mediated colonisation, differentiation and defect repair. Furthermore, we establish the significant role of HA in MSC adhesion in vitro and in vivo, and demonstrate that both inflammation and KJD modulate SF-HA. This knowledge may help explain the success of this emerging treatment, and also offers an insight into how, by providing a window of opportunity we can promote MSC/cartilage interactions towards accelerated cartilage repair. Therefore, as SF has a resident population of MSCs, therapeutic modulation of MSC numbers and their adhesion to cartilage in the OA environment, in isolation or in conjunction with joint biomechanical optimisation might represent a novel cost effective one-stage treatment for OA. We evaluated SF-HA and MSC adhesion in distracted and non-distracted OA canine joints. Using autologous labelled MSCs, adhesion to cartilage defects in these joints was observed. KJD was accompanied by a decrease in SF-HA in each animal when compared with the control, non-distracted joints, suggesting that increasing the joint space is accompanied by plasma effusion and equilibration of joint pressure, effectively diluting SF-HA. Joint effusion is also seen accompanying KJD in humans throughout the distracted period (personal communication with orthopaedic surgeons P van Roermund and R van Heerwaarde). Consistent with our in vitro data, the abundance of HMWHA species had a negative impact on cell adhesion within these defects. Thus confirming that in vivo HA also influences MSC/cartilage interactions. Finally, in long-term follow-up experiments (without addition of MSCs), KJD showed improved structural outcomes and reduced synovial inflammation indicating restoration of joint function (see online supplementary figure S4),34 supporting a recent porcine study also showing MSC adhesion to sites of cartilage injury, cell integration and apparent contribution to subsequent improved histological outcomes.20 We cannot definitively conclude that SF-MSCs mediated this repair or discount contribution from cartilage resident or bone marrow MSCs.35 However, our data highlights the potential of SF-MSCs to colonise cartilage defects without continued destructive loading under KJD and may be a contributing factor in joint repair. Inflammation and tissue injury is associated with HA breakdown38 ,48 and is further supported here, where increased C reactive protein in RA-SF negatively correlates with VHMWHA abundance (see online supplementary figure S3). LMWHA selectively binds to TLR4, which can stimulate MSC migration and vascular cell adhesion molecule-1 (CD106) expression.30 ,49 Another potent agonist of TLR4 is lipopolysaccharide (LPS), a potential bacterial contaminant of hyase. To rule out LMWHA or LPS involvement in SF-MSC adhesion, we repeated our plastic adhesion assays, supplementing culture medium with HMW and LWMHA and used heat inactivated hyase in this in vitro cartilage model. We also measured by flow cytometry, phenotypic changes to MSCs exposed to ±hyase digested SF. Only HMWHA inhibited SF-MSC adhesion, no effect of heat inactivated hyase on MSC/cartilage adhesion was seen and only minor changes in expression of known cartilage adhesion molecules were measured (see online supplementary figure S3),47 further confirming the role of HMWHA in MSC/cartilage adhesion. 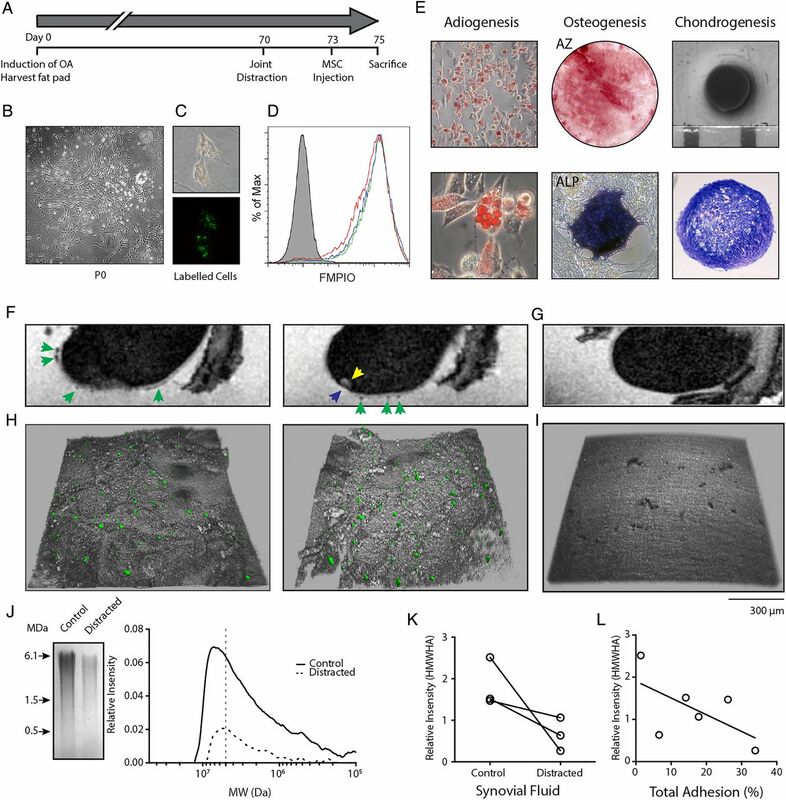 To conclude, this work opens up novel possibilities for use of both minimally manipulated endogenous as well as culture expanded allogeneic MSCs, allowing their use in more favourable environments encouraging MSC/cartilage interactions. The recognition that joint resident MSCs may be capable of adhering to cartilage in a HA-dependent manner when placed in the correct mechanical environment also provides a potentially novel explanation for the success of KJD in human OA and encourages the development of cost-effective, one-stage joint saving therapies. We would like to thank Dr Richard Hodgson, Jacqueline Dunkerley and Rob Evans at Leeds BRU for MRI support as well as Jackie Hudson for confocal microscopy support and Dr PM van Roermund for animal surgery. We would like to dedicate this work to the memory of Stuart Calder who tragically passed away after submission of this manuscript. He was a valued friend and colleague without whom this research would not have been possible. We thank him for his support of our work and the indelible mark he made in our lives and those of his patients.
. TLR4-dependent induction of vascular adhesion molecule-1 in rheumatoid arthritis synovial fibroblasts: Roles of cytosolic phospholipase A(2)alpha/cyclooxygenase-2. J Cell Physiol 2010;223:480–91.
. Hyaluronic acid (hyaluronan): a review. Veterinarni Medicina 2008;53:397–411. Contributors TGB designed, conducted the majority of the experiments, analysed the data and prepared the manuscript. DM and EJ conceived the study and helped in interpretation of the data and manuscript preparation. SJC and SCM helped in the design of the experiments, sample collection and manuscript preparation. SCM and FPJGL designed and conducted the animal study and contributed to the drafting of the manuscript. Funding This work was funded through WELMEC, a Centre of Excellence in Medical Engineering funded by the Wellcome Trust and EPSRC, under grant number WT 088908/Z/09/Z, by the National Institute of Health Research via the NIHR-Leeds Musculoskeletal and Biomedical Research Unit and the Dutch Arthritis Foundation.